Department Chair Charlotte Brow was presented an Excellence Award at this year’s International Conference on Teaching and Leadership Excellence. Mrs. Brow, the chair of the college’s Humanities, Fine Arts and Social Sciences Department who also teaches history, was presented an “Excellence Award” at the National Institute for Staff and Organizational Development’s International Conference on Teaching and Leadership Excellence in Austin, Texas. 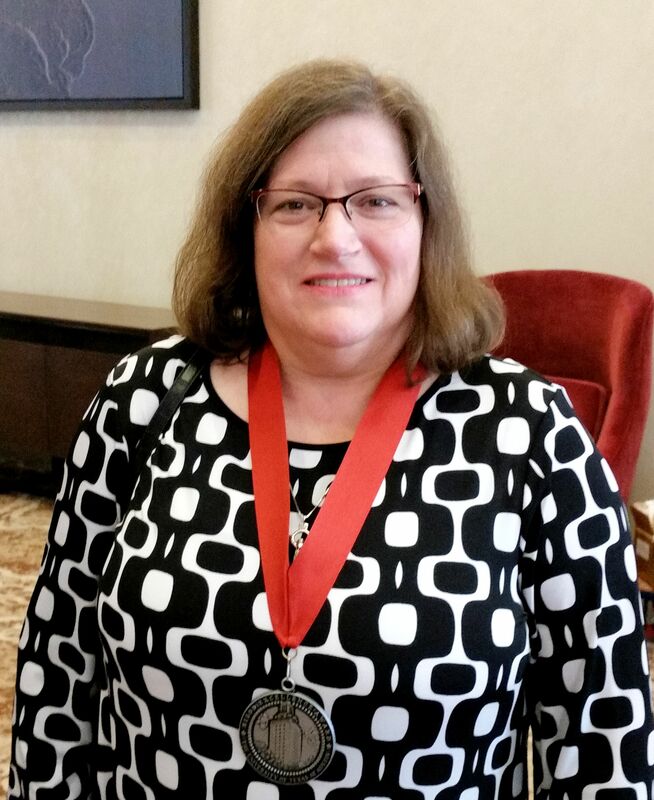 She was recognized for outstanding service and teaching excellence and presented a special medallion that will become part of her formal attire for commencement and other academic ceremonies. Mrs. Brow was presented her medallion during a special dinner and celebration at the NISOD annual conference. Four other WCC faculty members who did not attend the conference were also recognized and will be given their awards later by WCC President Thomas A. Walker Jr. on the college’s campus. David Vinciguerra, Simulation and Game Development instructor, 2016 Wilson Award recipient. The National Institute for Staff and Organizational Development is a membership organization committed to promoting and celebrating excellence in teaching, learning, and leadership at community and technical colleges. For community and technical colleges that want to make the most of their professional development dollars, NISOD provides budget-friendly, high-quality, and faculty-focused programs and resources. For 40 years, NISOD’s customer-focused approach has helped align a wide array of benefits with the needs of its members, which explains why the American Association of Community Colleges named NISOD, “The country’s leading provider of professional development for community college faculty, staff, and administrators.” Visit www.nisod.org for more information about NISOD.